The Taurus children peacefully wander through life, leisurely avoiding obstacles and seldom missing events seen along the way. Since Taurus looks strong as an ox, people often do not notice his inner softness, but a mother born under the sign of Cancer always notices what others are missing. She knows when a child needs extra care and love. Taurus children need physical contact especially to make sure that their parents love them. This sign appreciates one embrace more than a thousand assurances of "I love you." 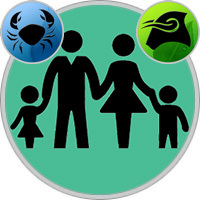 Taurus is inclined to adhere to generally accepted views, because Cancer parents will not need to adapt to the latest hobbies and modes that change so quickly among schoolchildren. The Taurus child does not strive to stand out in the classroom with some unusual "highlight" in appearance, at least until it becomes generally accepted among all his classmates. But since Taurus is ruled by Venus, such a child will avoid ugly or ridiculous things. Both Taurus and Cancer are resourceful natures, inclined to store any memories in an embodied form. If Taurus and Cancer could, they would have saved the whole of their past lives to the last detail. If Taurus is not the owner of constantly growing collections of stamps or stickers, it means that he saves pocket money with diligence, which would be envied by the bank manager. Since childhood, Taurus appreciates money, likes to recalculate their savings - this trait develops with age, becoming a flair for financial affairs. Affectionate Cancer mom adores her child-Taurus, who filled her cozy home with a feeling of happy serenity. Taurus is tied to mother and home, believes that there is nothing more delicious than mother’s meals in the world. All this allows mother Cancer to feel loved and respect herself for being such a caring mother! These two all the time stretching towards each other, as if in each there is a piece of a magnet. And they know that they will have mutual affection for the rest of their lives. Cancer mom loves to have her house exactly the house - warm and reliable. And it’s in this atmosphere that Taurus feels best! The mother is quite happy that her child is not in a hurry to grow up and leave her to start her own life. Who said that he has a somewhat slower development? This mother is absolutely sure that children should not behave like little adults at all. She prefers to protect and cherish them, heating her with love. Taurus is delighted that his mother prefers to stay at home for guests. True, we must see to it that it does not turn into seclusion. Well, trips to the sea and walks in the forest could make both happy and healthy. Next to the mother Cancer, Taurus will always find that reliable harbor where you can hide from cares or take a break from the pace of life that others impose on him. The mother understands his need for relaxation and does not consider it laziness. She sees that Taurus needs to recharge their batteries from time to time. Both of them like to eat, and if the child does not follow, the sophistication of the mother’s cuisine can affect Taurus not in the best way. Mom is happy that they are connected with Taurus emotional closeness: this is exactly what she always dreamed of, thinking about the relationship of children and parents. And the Taurus baby so loves the soothing presence of his mother that he is willing to spend whole hours comfortably sitting next to her with a book in his hand or at the TV. Cancer father is truly devoted to his child and is ready to make any sacrifices for his future. He agrees to take him to dance or music lessons, checking that he did not miss anything. Cancer does everything in its power to ensure the reliability and solidity of life that Taurus so needs to gain self-confidence. And he will always try to listen carefully to the child, and this means so much! But to the carefree Taurus it is difficult to understand the father, if one of his moods is suddenly replaced by another. Sometimes my father wants to show that he firmly holds the reins of government in his hands, and he expects that Taurus will obey him without discussions and objections. But the Taurus are so stubborn, and if the child does not think that the father is right, he will stand on his ground, refusing to do what is told to him. And this can not be ignored. Father-Cancer, this attitude can be confusing. And although he is not so sure of the correctness of his actions, as he demonstrates, he does not want to be challenged. Cancer loves his home, and he is pleased that his child shares with him the joy of owning material possessions. He so likes to be the master of the house, and his child-Taurus does not at all find it painful, as it might seem to other, more independent signs. Sometimes Taurus so "grows" in this cute from childhood coziness, that would not prevent a push from outside to get him out of a state of laziness. Cancer dad is not strict enough when he agrees with Taurus’s reluctance to change what is so familiar. But it is he who must push his child to change in time.